Just a quick note to get back into the blogging groove (been somewhat preoccupied microblogging on Facebook and to an extent Twitter). The next version of Thunderbird has the project name Lanikai which made me super happy because it's one of my favorite beaches of all time. Some photos. Lanikai beach is on the East side of Oahu, in Lanikai and near Kailua (which is where the Obamas like to stay when they visit Hawaii). 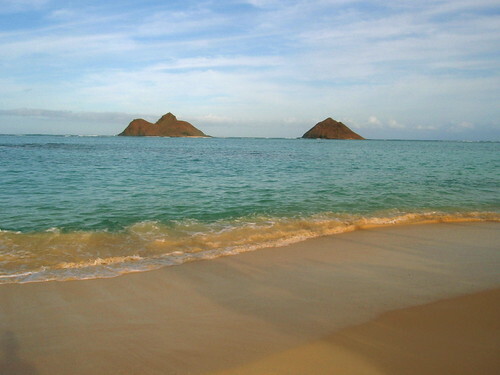 You can walk up to Kailua beach for more action where there's windsurfing, kite surfing, and kayak rentals. What's interesting is that they're not crowded at all, probably because the towns of Kailua and Lanikai are a bit far from Honolulu and they're small sleepy towns, more local than tourist area. The water is very clear, warm, and it's a very swimmable beach. The sand is white to light tan and soft. The beaches are easy to access, and stores are near enough for some coffee, snow cones, or sun block. I like to think that part of the reason we're going with Lanikai and beach themes is that it's aligned to how we're thinking about the Thunderbird email client. We want to make Thunderbird run so efficiently that people spend more time on the beach than in their email. Sounds good to me. We just released Thunderbird 3 Release Candidate 2. Check out the post at SpreadThunderbird for details. But what about Thunderbird icon? Will it be updated too? Please! Short answer, yes. You didn't even need to say "pretty please". We're beginning the work to update the Thunderbird icon. We really like how the Firefox icon turned out, and we'll be working with the folks at Icon Factory so we can be consistent. I've been impressed with how Alex Faaborg has led the charge with the Firefox Icon refresh, his vision, and his ability to communicate and work with everybody. We're working with Alex as well, he's got a great eye, and we're lucky. As I understand, it's going to be fast and furious in terms of the design and feedback loop the next couple weeks. I'll be posting a final creative brief before we get started, and happy to take feedback on it now. I'll be posting the iterations and calling for feedback as soon as I get them. It would be great if all feedback can be done as comments to these blog posts as opposed to direct emails to me.